Some dogs have a tremendous amount of dignity when it comes to pain. They hate to show you they’re in any kind of discomfort, and will hide their pain with rigid determination. Collies are particularly good at hiding pain, and pretending everything is fine. So when a collie comes limping up to you, yelping and making the most horrendous noises, you really think something is wrong. It’s always best to get proper, professional advice. When a dog is showing you that they’re in this much pain, you have to act immediately. 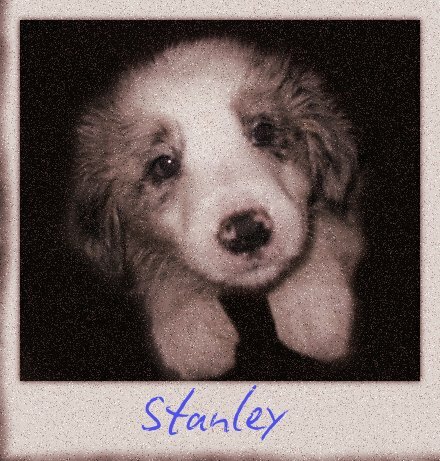 Stanley, a large blue merle boy (the photo is of when he was a baby – many years ago now! ), hopped across to me, holding his paw up, whining. I held his leg very gently, and pressed lightly all the way up and down his leg. I was worried that the level of pain was such he may have broken a bone. Nothing felt out of the ordinary, and Stanley didn’t flinch even once. Encouraging Stan to lay on his side, I took a good look at his paw; no cuts or abrasions, and his toes all seemed fine. There was nothing to be found in between his toes, and nothing seemed to be out of place. I looked closer and closer.. and eventually found a very tiny thorn. And when I mean tiny, I mean TINY. It appeared to be a new growth thorn that was still very flexible and so, so small it was almost imperceptible to the naked eye. I managed to get the thorn out of his paw very easily with no drama, and just as I heard “They’ve got an appointment at 9:30… is that okay?” Stanley went bounding off happily past his mummy. Sometimes, the smallest thing can cause the biggest pain, and the bigger issues can result in a dog showing you no signs of illness whatsoever. Don’t ever assume that a little injury is a little pain (an actual paper cut seems disproportionate with the actual pain caused! ), and yet you can seriously injure your back when focussed on a particular job, and not notice until much later on. This entry was posted in IYD Blog on October 25, 2014 by Site Editor.